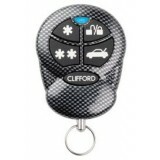 new 4 button hornet remote ..
Clifford OEM Original Replacement remote control. 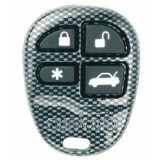 Clifford 5-Button Remote Compatible with Clifford models: Avantguard 5.1, Intelliguard 770, Concept 470, Concept 650-II Not compatible with G4 or 2005 G5 alarm systems ..
Clifford OEM Original Replacement remote control. 4-Button 10 channel remote allows for full adjustments with the compatible alarm system Carbon Fibre finish 'Clifford' label is the shift button Compatible with all G4 & Matrix systems (exc RS3) - see below: Concept 450 G5 Solari..
Clifford OEM Original Replacement remote control. 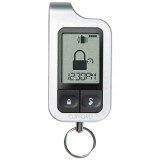 Clifford 5-Button "Radar 2" TX Replacement Transmitter for Select Clifford Alarm Security Systems Cool Blue LED Carbon Fibre finish 'Clifford' label is the shift button Compatible with all G4/G5 & Matrix systems (exc RS3) Comes s..